Lidocare is the newest over-the-counter/non-prescription lidocaine pain patch that delivers fast relief through the localized delivery of 4% Lidocaine - the highest strength available without a prescription. Lidocare is the ONLY water-free lidocaine patch available on the market. Lidocare can provide up to 8 hours of pain relief from aggravated nerves by blocking the pain at the site. Lidocare's form-fitting ultra-flexible pain-relief patches can be worn during daily activities, providing soothing relief for sore knees, shoulders, neck, elbows, and fingers. Lidocare's lidocaine patches can be trimmed to size for smaller areas. 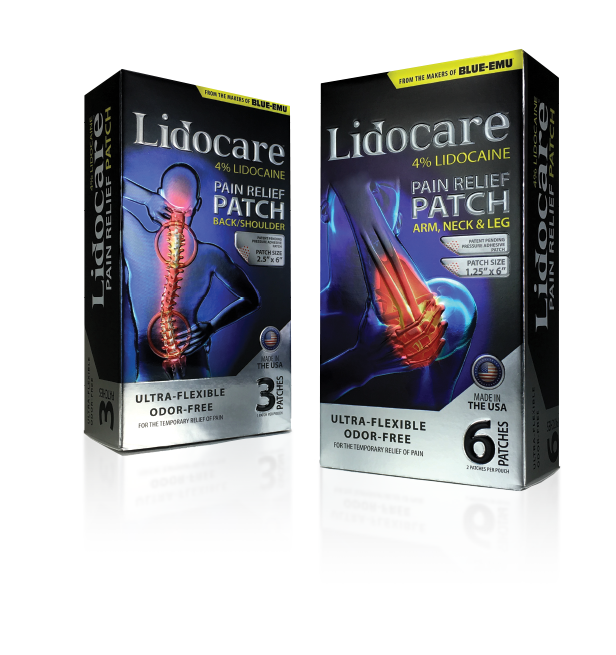 Lidocare is offered in two different packaging configurations: Lidocare Back/Shoulder (3 large patches) and Lidocare Arm/Neck/Leg (6 smaller patches).